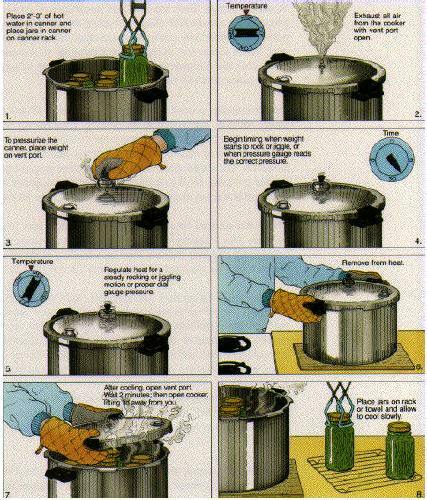 Pressure Canner FAQs: Answers to Common Questions About Home Canning Using Pressure Canner! Most are designed to hold seven quart jars or eight to nine pints. Small pressure canners hold four quart jars; some large pressure canners hold 18 pint jars in two layers, but hold only seven quart jars. Pressure saucepans with smaller volume capacities are not recommended for use in canning. Small capacity pressure canners are treated in a similar manner as standard larger canners, and should be vented using the typical venting procedures. Low-acid foods must be processed in a pressure canner to be free of botulism risks. Low-acid foods include meats, dairy, sea food, poultry, vegetables and many fruits. See this page: Acid content of common fruits and vegetables. Using a pressure canner instead of a water bath canner. See this page for the answer to this question. Is it necessary to exhaust a pressure canner? Yes, it is very important to allow steam to escape for 10 minutes before closing the valve, or placing the weight on the vent. If the canner is not exhausted, the inside temperature may not correspond to the pressure on the gauge. Why is there sometimes a loss of liquid during processing? Loss of liquid may be due to the fluctuating pressure in the pressure canner, food packed too tightly in jars or lowering pressure too suddenly. At the end of processing time, allow the pressure to drop to zero naturally and wait two to five minutes before opening the lid. Am I able to process green beans in a hot water bath? A lady at the farm market here told me she has always done it this way, boiling it for 3 hours. I just wanted to be sure this is a safe method before doing it. Nope. That lady is providing dangerously bad and wrong advice! It doesn't matter if you boil them until they turn to mush, because boiling water at sea level never gets any hotter than 212 F, and the Clostridium botulinum is not killed by 212 f; even for hours. It's just enjoying a nice bath. A water bath canner is fine for acidic fruits and vegetables, such as jams, jellies, applesauce, apple butter, and even tomatoes, but for almost all other vegetables, like carrots, squash, green beans, etc. you'll need a pressure canner. The spores are present everywhere, but are harmless until it finds itself in a moist, low-acid, oxygen-free environment or a partial vacuum. Under these conditions, the bacterium can grow and produce toxins dangerous to people and animals. Only subjecting it to the higher temperatures (240 F) of a pressure canner can the spores be killed. So how did the lady survive? She probably just ate her goods before enough of it grew to reach toxic levels. Or maybe the spores didn't grow in that batch. But that doesn't make it smart. We all know people who smoked a pack a day and lived to 90. But that doesn't make it smart nor safe to play Russian Roulette with a jar of green beans and your family. Another low acid food question: I processed green beans (or corn, meats, other low acid foods) in a boiling water bath. The lids sealed. Doesn't that mean the beans are safe to eat? No. The fact that the lids sealed means that a vacuum was formed inside the jars. It does not mean that spoilage organisms were killed. Discard the beans--they could be dangerous. The only safe way to can green beans is in a pressure canner. Which pressure canner is more accurate, the kind with a dial or the one with a weighted control? The weighted control tends to be more accurate. Both types are accurate if used and cared for according to the manufacturer's instructions. Some people prefer to see the pressure reading on a dial; others prefer the sight and sound ("jiggling" noise) of the weighted control. The dial control must be tested frequently for accuracy. The weighted control doesn't need this, but it must be cleaned occasionally for good service. People who live at higher altitudes may prefer the dial because the altitude adjustment can be made more precisely. Can I run cold water on my canner filled with pint jars of corn at the end of the processing time to quickly cool them so I can start a new batch? No. Never try to rush cooling by pouring cold water over the pressure canner. 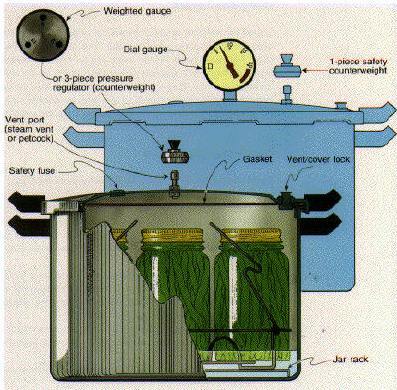 The complete processing time includes the time the pressure canner cools. If cooling is rushed, the foods may be underprocessed. In addition, rapid cooling may break the jars. Can a pressure canner be used on a smooth top range? For a pressure canner to work successfully on a smooth top range, the canner bottom must be flat and in contact with the cooktop. Most heavy cast aluminum canners meet these specifications. Lightweight aluminum canners have a concave bottom. If the concavity is greater than 1/8 inch, the canner will not perform effectively. To measure the concavity, place a straight edge across the canner bottom and measure the distance to the canner bottom with a ruler. See this page for much more information. Can a pressure canner be used on a solid element cooktop? Solid element cooktops require heavy gauge, flat, smooth bottom utensils that have no more than one-inch overhang beyond the element. Most pressure canners are too large to be used on solid element cooktops. See this page for much more information. Can I double stack jars in a pressure canner? Yes, you'll need a perforated plate or a small cookie / cake cooling rack to lay on top of the bottom layer so the top layer would be stable, but that's about it! The pressure canner manufacturers say the practice is safe! My pressure canner is the self-venting type. Why do your materials say all pressure canners must be vented for 10 minutes? All pressure canners, including "self-venting" pressure canners, need to be vented 10 minutes before the pressure is allowed to rise to be certain that all air is removed from the pressure canner. If there is air in the pressure canner, the temperature is much lower than if the canner contains only water and steam. Research has shown that under some conditions (particularly with raw-packed foods) all air may not be removed from self-venting pressure canners. What should I do if the canner goes below the recommended pressure during processing? To be processed correctly, the canner must remain at the recommended pressure for the entire processing time without interruption..
Increase the heat under the canner to reach the recommended canner pressure. When the recommended pressure is reached, set the timer for the full processing time. In other words, you will start the entire processing time over again.